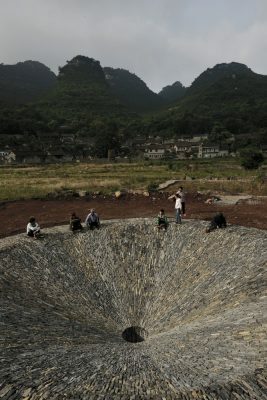 “Sinkhole Floor Drain” is a piece of land art that is associated with unique geological feature. 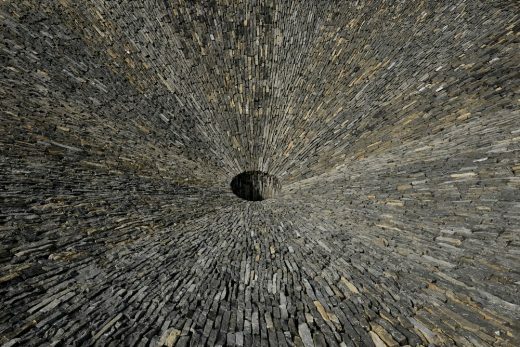 The location of the project is in a village in south west china—Yubulu Zhai. Yubulu Zhai is a natural village of Qingshuihe town, Xingyi city, Southwest Guizhou Autonomous Prefecture, Guizhou, China. It is an “untouched paradise” in Southwest Guizhou Autonomous Prefecture which is 20 kilometers away from Xingyi down town. 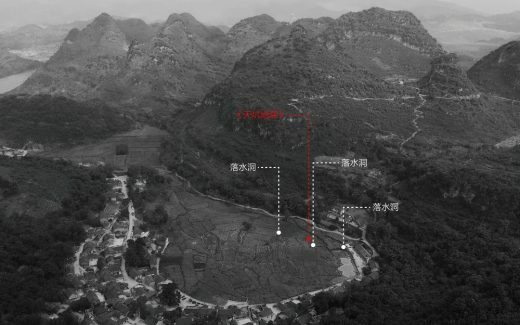 The area where Yubulu Zhai belongs to is a place with typical Karst landscape. 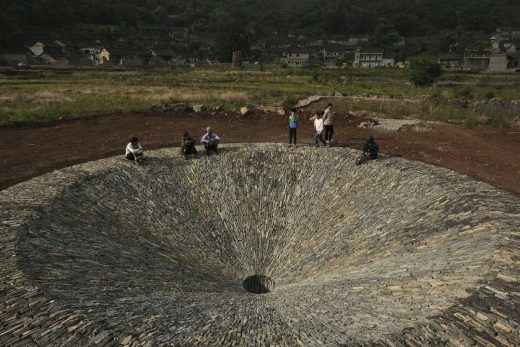 The village is built in a sinkhole whose relative fall reaches 610 meters. The sinkhole is trumpet-flower-shaped, and numerous century-old buildings are perfectly preserved in this village. Some of the houses are even built directly on native slate without digging deep foundations. 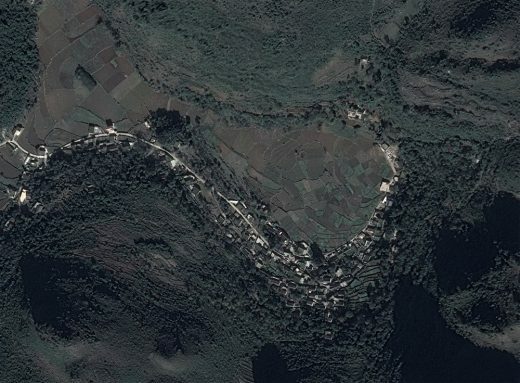 Land around the village is fertile and wooded where fertile fields, mountain spring, stone cottages, ancient trees, old well, karats cave, tall bamboos, ancient river, ancient camp and ancient Tea-Horse Road form delightful contrast. This untouched paradise surrounded by mountains is thus formed harmoniously and naturally. Houses in Yubulu Zhai are built along the external part of the sinkhole, and the central sinkhole is vast stretches of open farmlands. According to old man of the village, more than a decade ago, when rainstorm hits, rain from surrounding high mountains will gather to the sinkhole, the farmlands in the sinkhole will then become a “lake”. Four or five days after the rainstorm, rain water will drain away, and the “lake” turns back into farmlands. The secret that rain drains away so fast is that there are four holes in the sinkhole which were named “water draining hole” by locals. These “water draining holes” work as “floor drain” of the farmlands and connect with underground river. The rainwater drains away through underground river. Due to continuous drought in recent years, there is dramatic reduction in rainfall and rainfall intensity is weakened, this leads to the disappear of the phenomenon of “farmlands turning into lake, and lake turning back into farmlands”. Now, at the mouth of the hole, grass and trees grow wildly, without the guide, it will be very difficult to find these magic “water draining holes”; let alone imaging their magic water draining function. It is predictable that, as time flows, the shared destiny of “water draining hole” and the village will be forgotten eventually. The purpose of the creation of “Sinkhole Floor Drain” is to strengthen the geological characteristics and historical memory of the field. This project is in the shape of “funnel” . The diameter of the top edge is 9 meters and the depth is 2.4 meters, while the diameter of the lower edge is 1 meter and the depth of the hole of the lower edge is 1 meter. 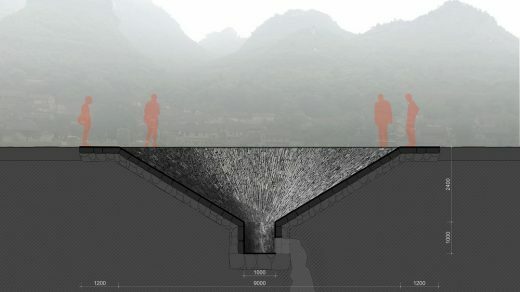 A hole with a diameter of 30 centimeters which connects with underground river is left at the side wall at the bottom, so as to enable the floor drain to drain away rain better when rainstorm hits. 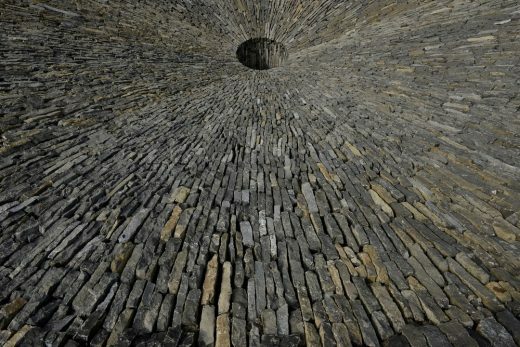 The surface layer of the “funnel” is paved with local shale and radiates out in all directions, and the dense radiation pool towards the bottom of the hole, this give people a strong sense of being dragged into the hole. 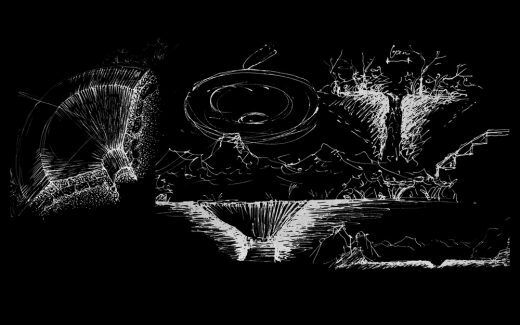 It seems that the black hole at the bottom of the “funnel” is full of mystery and danger, driven by curiosity, people would like to walk down to the bottom to have a closer look.